With 70 million fans, NASCAR is the #2 spectator sport, after football. But unlike football, going to a race is a full weekend of events. From the tailgating, to the qualifying, to the checkered flag and post-parties–there’s enough to fill several days at every event, and that’s just at the track. — Where to find veterinary services for the furry four-legged members of your family, and much more! 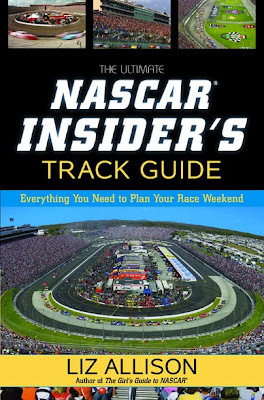 From dining, to shopping, to lodging, not to mention what to wear and pack (and what not to) this is a practical guide that no NASCAR fan should be without! My husband, Kendall, is a car fanatic. He loves watching racing, car shows, upgrades and spends his time in the garage tinkering. He has gone to local racing events and car shows so I figured he would enjoy this book called The Ultimate NASCAR Insider’s Track Guide. The book is written by top NASCAR authority, Liz Allison. With his work schedule he didn’t really have time to have a good look at it and said to maybe pass it on to somebody else who would really be able to look at it. Somebody that has track experience with racing and who would appreciate all it’s highlights and best things to see and do at all 22 tracks on the NASCAR Sprint Cup circuit. So I passed it on to a friend who actually is involved with actual races and is down there in the pit and would appreciate knowing things about the actual tracks and sights when you plan a trip to go to a big NASCAR event. His name is Trevor and this is his review on this book. The book was great. I enjoyed reading the little tidbits about each track and knowing the hot spots to eat if you visit the tracks is good info to have.. The track records were nice to know even though its a year behind. There were a few records broke last year that I knew but other than that the book was awesome. Too bad I can’t travel to a bunch of them to use the book! So there you have it…a good book to buy and have on hand for those of you that travel to the tracks and don’t want to spend the whole day looking for things to do. Disclaimer: I received this book from the Publisher in exchange for an honest review. No monetary compensation was involved.